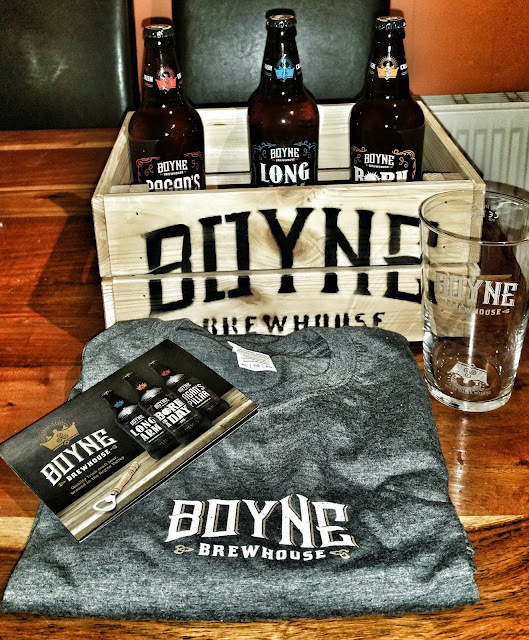 I was recently sent some beer by the lovely people in Boyne Brewhouse in Drogheda. They sent me a crate with one of each of their beers along with a T-shirt, a glass and some spiel. I'll be honest, I didn't read the spiel because I prefer to make up my own mind about the beer I'm sent. Beoir visited the brewery earlier this year. I believe I was away because I missed it. By all accounts, it's a very impressive facility as a lot of money has been invested in it. The Cooney family owned Gleeson's, a bottling and drinks company which they sold to C&C in 2012 minus a cream liquor and cider company which they still own. This sale provided ample funds to establish a purpose built brewery and distillery. Up first is Pagan's Pillar which they describe as a sparkling copper ale. I wonder about the choice of style name for this one. 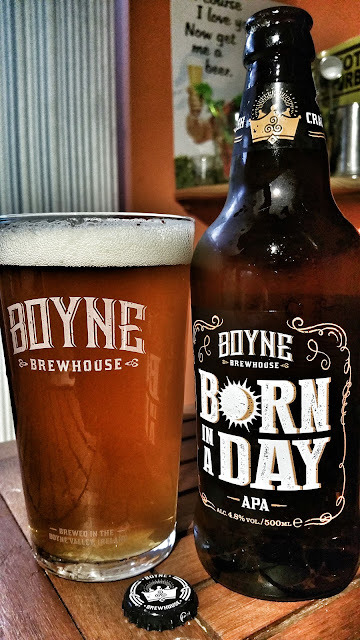 Head brewer Aine spent a number of years brewing in Australia before returning home. I wonder was she influenced by Coopers Sparkling Ale? Anyway, the beer tastes nothing like Coopers. It's intensely bitter for one thing and it caught me off guard because I was expecting a more traditional Irish red ale sort of beer. Looks like they use a relatively new hop called Mandarina Bavaria which provided a bit of orange and pineapple notes. The beer is extremely dry with very little sweetness beyond a bit of caramel and just the barest touch of roast. A simple beer that works nicely. Born in a Day also caught me off guard, mainly because it was so similar to the other one. It's perhaps a tad lighter in colour despite the picture above. 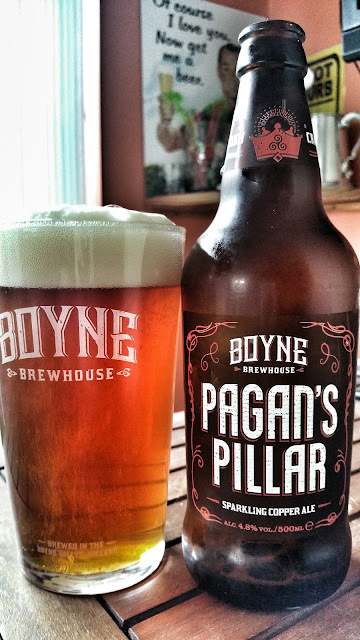 Pagan's Pillar was back-lit with direct sunlight but it was darker when I pictured the APA. There's perhaps a little more grapefruit style citrus notes but otherwise, it might as well be the same beer. Another solid but not very exciting beer and I somewhat preferred Pagan's Pillar. And that brings us to the last of the trio, Long Arm. It's a Dortmunder Export according to the front of the label which is perfect for testing my BJCP knowledge as it's a style we don't get much of in Ireland. It should really be similar to a Bohemian Pilsner but with higher sulphates, chlorides and carbonates compared to the soft water of Pilsen. Long Arm is at the low end of the scale in terms of ABV at 4.8% . Enough arsing around with BJCP, it was time to taste the beer. I have to say, it was the best of the three beers by a long margin. A very clean and clear beer with plenty of lovely grassy, spicy goodness from the use of saaz hops. Interestingly, the beer is also intensely bitter and since saaz hops are used exclusively and they have a very low alpha acid rating (basically bitterness rating), I can only conclude that the same high sulphate, hard water is used for all three beers which could account for them being so bitter. There's a lovely malt body here but the bitterness is pervasive. Personally, I loved the combination but I know a lot of people might be put off by it because they prefer sweeter beers. 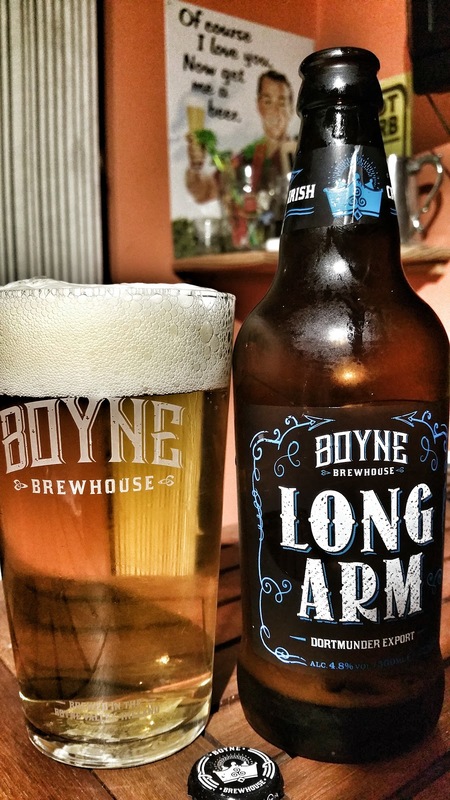 I'll be looking out for Long Arm on tap.